Your first visit will typically last one to one and a half hours in length, depending on your specific need and condition. The session includes a medical and life-history review followed by a non-invasive Traditional Chinese Medicine (TCM) exam and treatment. 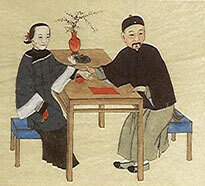 Traditional Chinese Medicine date back more than 2,000 years. Do not arrive feeling rushed or hurried. Do not eat a heavy meal or consume alcohol prior to treatment or immediately following it. It is very important not to scrape or brush the coating from your tongue on the day of treatment. One of the unique aspects of Oriental medical diagnosis is tongue analysis. Examining the tongue in its natural state will help us greatly in selecting an appropriate treatment strategy. Wear loose and comfortable fitting clothes that can be easily rolled up above your elbows and knees. A gown is available if necessary. Follow your treatment with a light meal and quiet rest, preferably for the remainder of the day/evening. If you wish to bring a family member or a friend to your appointment or have them accompany you into the treatment room, you are welcome to do so; however, most patients prefer conducting the medical history interview portion of the appointment in private. Children under the age of 18 must be accompanied by a parent or a legal guardian. Cell phones, electronic pagers and other wireless mobile devices should be turned off upon entering the treatment area to ensure maximum relaxation. Please be on time for your appointment, so that you may benefit fully. In case you need to cancel your appointment, do so 24 hours prior to the scheduled time to avoid paying a missed-appointment fee of $25. If you are late for your appointment we will provide as much treatment time as available. You will, however, still be charged the full amount for your scheduled session. Payment is due upon receipt of services. If your insurance covers the treatments, we will submit the claim for your reimbursement. Thank you for your confidence and for giving the AcupunctChi Clinic the opportunity to help you attain your health goals.